This week we launched our Annual Student Recruitment Survey with a bang. It reported that student hires overall had increased by 16% this year. Employers are recruiting 7% more graduates and apprenticeship and school leaver programmes grew 50%. There were also more summer and year-long internships, increasing 10% and 31% respectively. While this paints a positive picture, with student employers currently undeterred by economic concerns around Brexit or the global trading climate, we also found that much more needs to be done to improve diversity. People who attended state schools, women, first generation graduates and disabled people are all underrepresented on graduate programmes. For example, there were only 57% of graduates appointed from state-schools, compared to 91% of the population. 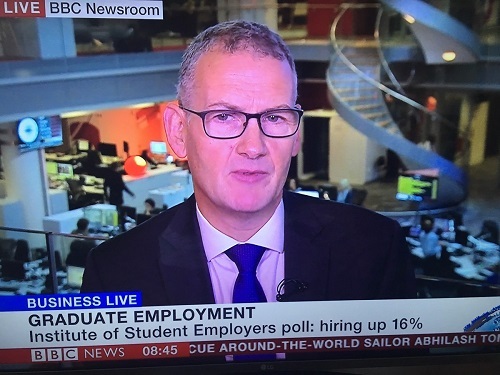 BBC Breakfast broke the news of our report while CEO, Stephen Isherwood, explained the social mobility challenge on BBC Business Live. The Financial Times cited how apprenticeships are helping to improve diversity and we raised awareness of the underrepresentation of state schools in The Times, Independent, The Daily Telegraph, among others. This year’s recruitment survey made it clear that employers are taking some serious action to improve the diversity of their workforce and there is a high level of concern, particularly as graduates from state schools are potentially being locked out of some of the best career options. Nearly all (96%) of the employers who responded to the survey reported that diversity is a significant challenge. The majority are investing in improving their attraction and marketing activities (77%) and recruitment and selection processes (67%). One in five employers have now removed minimum entry requirements while more than a third select universities to improve the diversity of their hires. However, on almost every diversity measure, the average graduate intake does not reflect the graduating cohort or the UK’s population. We must find the means to recruit the talent that exists within the breadth of the student body. This means changing the nature of recruitment and selection processes and putting less focus on Russell Group institutions or those that companies have historic links with. Of course it is important to look at the wider social obstacles too. We can’t expect businesses to shoulder the full responsibility for an unequal society.